My son is currently in the stage of “always on the go” toddler. He loves new experiences, but his attention span is also short and he’s distracted very easily. We jump from activity to activity throughout the day. It’s amazing to watch his reaction to the world around him. I’ve said it before and I’ll said it again – books are great at every age. This is especially true of toddlers and board books. We keep a basket of books available at all times for my son. He loves to look through the books and find a favorite to bring to us. Then, he climbs into our lap and listens as we read. We’ve been reading to him since he was a baby and he’s already picked up a few essential book skills, including how to turn the pages and treat them with respect. I credit this to our consistency with him. If you haven’t already been reading to your child, I recommend introducing it as part of your naptime or bedtime routine. This way, you’re guaranteed to get a book in each day and your child will quickly pick up some new skills simply by watching you. Music is another one that’s great at any age. With babies, I recommended singing songs, but with toddlers, I recommend bringing in music in a variety of ways. In addition to singing, this could include CDs, music videos, musical toys, and so much more. Remember, music helps your child’s language development. Toddlers will interact with music in different ways as they grow. You might get to see a mini dance performance as a fun song plays on the radio. Or you might get to experience a musical performance using toys. Music can even make playtime a little bit more fun by providing some background noise. Sensory bins have been a big hit in our house! A sensory bin is essentially a bin filled with objects and some sort of sensory experience. The easiest (and most popular) sensory bin is a water bin or table with a few toys. These bins and experiences can provide your child with endless entertainment and learning opportunities. Toddlers are curious by nature. They are learning about the world around them and constantly adding new experiences to their knowledge bank. One of the easiest ways to help them do this is by simply allowing them to explore – especially outside. When allowing your toddler to explore, you definitely need to be supervising to prevent unsafe situations but it’s best to intervene as little as possible. As our son grows, we’ve been giving him a bit more freedom around the house and it’s interesting to watch him explore and learn about different things. He’s learning what’s off limits and what it’s okay to touch. He’ll often pick up new things and simply stare at them as he tries to figure them out. He also loves to put things in his mouth, which is why I’m going to give you another reminder to supervise your toddler’s explorations to help keep them safe at all times. Every age has it’s own unique toys. With toddlers, they are in a bridge between baby toys and preschool aged toys. I’ve noticed that my son still likes to take some of his “baby” toys and use them in new ways. In addition to this, he’s bridging into toys for older kids like mega blocks and stuffed animals. When it comes to picking toys for this age, it’s important to know your child. Each one is an individual and different toys will get different reactions. Many toddlers like to put things in and out of containers, so shape sorters and similar toys are typically a big hit. Stacking blocks and rings are also popular at this age as they figure out how things fit together in the world around them. Overall, I’m finding this age to be a really interesting age. It’s one filled with wonder and exploration. It’s also an age filled with meltdowns and testing limits as my little one grows into his personality and figures out his place in the world. Emotions are high and I often have to keep that in mind when picking activities. In fact, distraction and new activities can often save us from a total meltdown. I love hearing your thoughts and suggestions! 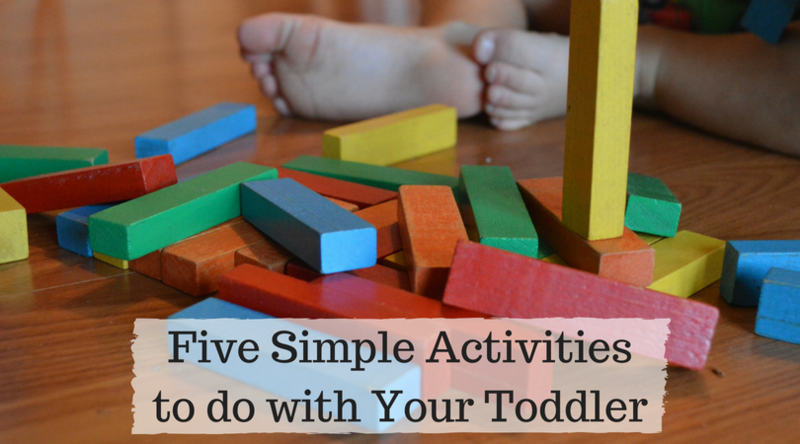 What are some of your favorite activities to do with a toddler?